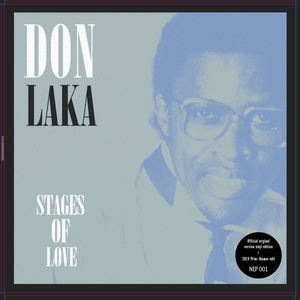 Don Laka is a South African jazz and funk musician. He was an influential musician in the '80s and '90s, working with the likes of Sipho Mabuse, Brenda Fassie, and Sankomota. In 1986 he released a four track EP, Stages Of Love. The track "Stages", an upbeat, synth-driven disco song, has never been released like this before. Here is the original, pressed on a whole side. The other side contains a delicious Prins Thomas edit, almost nine minutes of high-octane South African disco-boogie.